Riders of all levels are welcomed into our community where we come together to enrich lives, improve health, and increase access and opportunities to ride. Cyclists throughout Greater Philadelphia's nine counties are protected by the Bicycle Coalition’s fight for laws, facilities and networks that keep all cyclists, pedestrians, and drivers safe. Sign up for our newsletters to stay informed on issues relevant to you as a cyclist, and hear when we're hosting free classes, events, and rides near you. 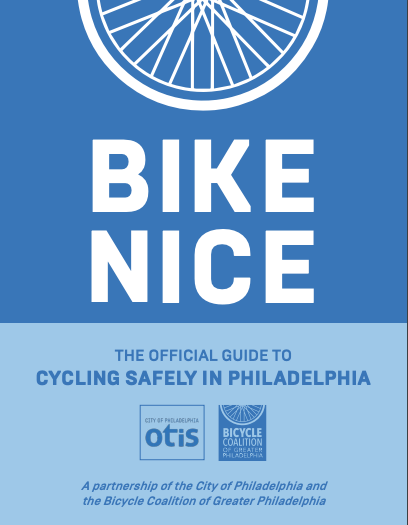 When you subscribe, we'll send you our free guide to safe cycling in Philadelphia. We ask for your address because we like to keep things local— you'll receive updates about what's happening in your area, including neighborhood meetings and advocacy alerts to contact your elected officials. - Cyclegram: Our main way of communicating with our supporters! We'll deliver bi-weekly newsletter with updates on our work, helpful resources for biking in the region, and upcoming events. - Biking the Suburbs: Your go-to for news, events, and advocacy for cyclists in the counties surrounding Philadelphia. - Volunteer: Get notified about volunteer opportunities with the Bicycle Coalition! - The Circuit: Learn more about the 100s of miles of happy right in your backyard! Your source for news about our regional trail network. - Women Bike PHL: Connect with the community that puts on programming for women, trans, and nonbinary cyclists. - Bicycle Coalition Youth Cycling: News from our youth cycling program.